One of the platforms I worked on at Glazer’s was to obtain the leading or second best-selling beer of each country in the world. If I could not acquire said brand, then the goal was to look at other key brands, who owned the brand and what was its future. During this time, one of the companies that fit this description was Royal Imports, with Mackeson Stout and Whitbread from England. The brands were owned by InBev and sold under an agreement with Royal Imports, headed up by George Henricksen, based in Cincinnati. With limited resources, no employees, and a small team of brokers, George managed to build Royal into a nice business, selling several hundred thousand cases a year. At one point, George and I explored the possibility of Warsteiner and Royal doing a JV and consolidating. The process did not happen because the agreement that Royal had with InBev was time bound and InBev was adverse to an extension. In fact, when the agreement came to an end, Royal Imports was terminated, and George retired. InBev walked away from the all that volume and the work George did, and competing brand(s) picked up InBev’s left overs. Since then, InBev, in addition to buying AB, has acquired numerous import brands including St. Pauli Girl, Presidente, Spaten, Franzikaner, and Bass which were once imported by companies other than InBev. 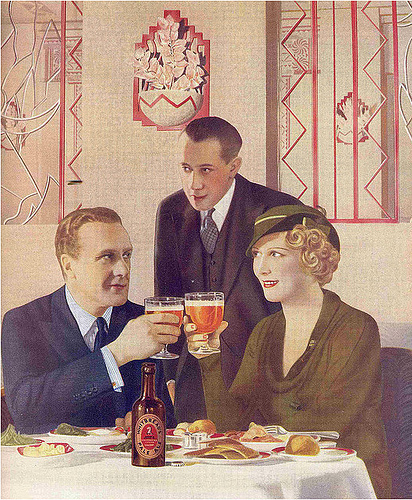 InBev also took Beck’s from Germany and began brewing it in St. Louis. They did the same thing with Bass. Because of this, AB distributors, encouraged by ABI, either traded or bought these InBev brands from their competing wholesalers if they did not already distribute the beers. Consolidation on a smaller scale. A number of good brands and a lot of money changed hands in these transactions. As of this summer, the sales of these brands were considerably lower, just as InBev did with the sales of Mackeson and Whitbread. SPI was down -63,000 cs. or -22.6%, Presidente down -120,000 cs. or -51%, Bass down -65,000 cs. or -26%, Spaten/Franzikaner down -30,000 cs. or -25% each. Beck’s, once the largest imported German beer, down -207,000 cs. or -16%, Beck’s light, -35,000 cs. or -30%. So the question that distributors should be asking is why should we spend our money or give up growing brands to acquire products which ABI then simply allows to die? Perhaps once ABI gets all of these brands under their own distributor network they will ramp up marketing support. By not supporting these brands, since many are still in non-ABI houses, it makes it much easier for the ABI distributors to acquire the brands and at a cheaper price, too! Look at Beck’s; even though they have lost 207,000 cases, by adding a line extension in Beck’s Sapphire, that brand is +435,545 cs. more than offsetting volume losses. Sampler packs in the future could contain all ABI’s German beers. Such a pack could contain Beck’s, Spaten, and St. Pauli or a combination of others. All that is needed is to have all the brands under one roof in each market. Last month I traveled to Austin to speak about the beer industry to a group of professionals who worked for one of the largest research firms in the US. In addition to my beer talk, the branch manager asked if I would also spend some time on the importance of having passion for one’s industry. I delivered my talk at a craft beer bar close to the firm’s office. As you can imagine, most of the time was spent on the beer industry in general, but these young professionals, average age 26, had many questions about the craft segment, too. The last part of my program was, in fact, concerning careers and opportunities and the employees had numerous questions about the industry. As General Manager of Coors of Kansas in the late 1970s’, Coors enjoyed a 60%+ share of market in the state except in the city of Hutchinson, were the Coors share was 44%. 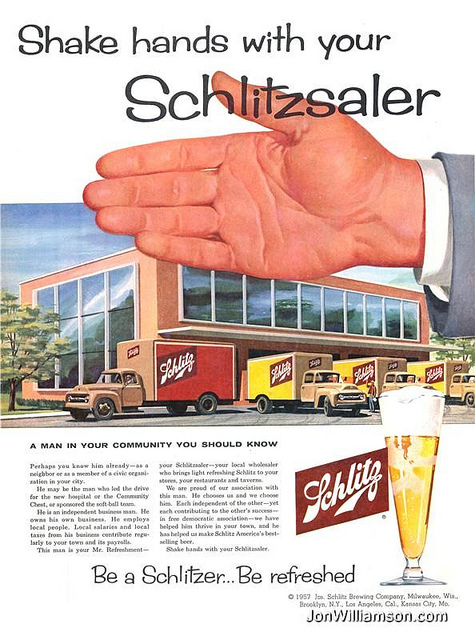 Hutchinson was the home of two small beer houses, Coors and Miller. The Miller owner, George, was very aggressive and had done a good job of getting share from Coors. We approached the Coors owner, Kenny, who decided to sell us his operation and move on. We purchased the operation and the first weekend after closing, we did a market blitz and acquired 17 new draft accounts in one day. These were the times when Coors did not split handles, so these accounts were exclusive to Coors. Within a month, we had Coors’ share back into the mid 50%+ and growing. Not long after our purchase, and investment in Hutchinson, a hand full of Miller employees showed up on a Monday morning for work only to find the warehouse locked. George had decided he had enough, cleaned out the company’s bank account and disappeared, leaving his Miller operation. Later, I found out he had resurfaced in California. The Miller operation in Wichita took over the Hutchinson territory, but by then Coors share was back to 60% in Hutch. In Scott Adams’s article he states that “his passion level moved with his success” and that “success caused passion more than passion caused success.” In my closing remarks for the talk at the Austin research firm, the final question asked was, “What was the best career decision I had made?” For me, it was easy, my answer was that I got into the beer business, because unlike George, I’m a beer guy, and beer is my passion! We made too many wrong mistakes…. Dallas County is made up of five precincts, and for many years, beginning in 1957, only Precinct 1 was wet. This area was composed of downtown Dallas and several miles north. Because of this politically-created wet area those stores located on the wet/dry line had huge sales. These stores were not grocery chains, but package and c-stores, which could sell beer on Sunday. The c-stores were small, old, buildings with walk-in coolers with beer was stacked to the ceiling and in every corner. By Monday morning, most of the c-stores were wiped out of inventory. Elmer conducted a weekly poker game which Henry quickly became a part of. There was no such thing as a National Accounts department in those days; beer was sold on one’s relationships with owners of the store. There were many ways in which a brewery rep. established their relationship with an owner, poker being one. During one such late-night game between Henry and Elmer, the final hand came down to the two of them. Elmer raised Henry, and because Henry was unable to match the final raise, he offered up his bass boat in lieu of cash. Elmer accepted Henry’s bet and subsequently won the hand and the opportunity to receive the boat. By this time it was well into the middle of the night, but Elmer insisted on following Henry home and getting the boat even though Henry tried to get Elmer to wait until the next morning. Henry took off with Elmer following him in his truck. After traveling a short distance they entered into a subdivision and went up and down several streets. Soon Henry slowed and stopped in front of a small, well-kept house. He got out and directed Elmer to back into the driveway and hook up to a nice bass boat. Henry hooked the boat up to Elmer’s truck, thanked him, and Elmer took off. About 45 minutes later, Elmer who now was about half way home, was pulled over by the Dallas police. He was arrested for stealing a bass boat! Unfortunately for Elmer, Henry didn’t own a bass boat. He just drove around until he saw one in a drive way and hooked it to Elmer’s truck. The actual owner of the boat had been awaken as Elmer drove off with his boat and had called the police. 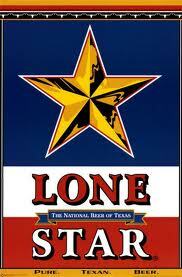 By the end of the next day, Lone Star beer was no longer available in any of Elmer’s stores! By the end of the week, Henry was no longer employed by Lone Star and looking for a new job. The annual NBWA convention just concluded in Las Vegas. This year represented the 75th year of the organization that started in Chicago in 1938. From those humble beginnings, the NBWA now represents 3,300 beer wholesalers and has become a successful lobbying force in Washington DC for the beer wholesalers. The first NBWA convention I attended was in the late 1970s, also in Las Vegas. Not surprisingly, the convention was not as well attended then as it is today. Forty years ago, the convention was almost exclusively composed of breweries and a few related companies, predominantly software, equipment, wearables and various p-o-s manufactures all in one room. Now the trade show takes place in a number of large rooms, with many different vendors, all aspiring to do business within the industry. Products represented at the show included flavored waters, energy drinks, (some with alcohol), crafts, imports, wines, etc. There are many products totally unrelated to the industry. The show featured not only the trade area, but a multitude of speakers, delivering information on various topics including industry issues; there were morning seminars, and, of course, all the meetings with current vendors. And, of course, the NBWA hosted numerous hospitality events put on by a multitude of vendors. Not long ago, I had 16 invitations to various hospitality parties for just the first day of the convention. These vendors were not potential vendors; they were current vendors we represented most of the 12 states in which Glazer’s sold beer. It made for a very long day. In California this year, 2,500 SKUs were measured in the grocery channel, however, only a small number, 205 SKUs, 8%, do a whopping 80% of the volume! Crafts represent about 1,100 SKUs at 10%, with 110 SKUs doing 80% of the business! When you drill down to flavors, many distributors have eight to 10 pumpkin beers just for the fall! How many of these does the market really need? 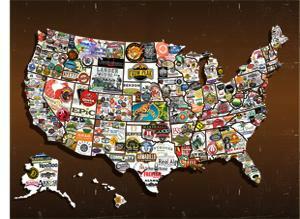 Nationally there are about 8,200 SKUs in US food stores with 52% or 4,426 SKUs representing the crafts! Of the 698 new SKUs this year, again 61% are crafts. The industry is creating 1,000 new SKUs per year which indicates that by the end of next year, there will be over 10,000 SKUs in the US. One wonders how many will be DQ’d by the retailer, wholesaler or brewery? So the question really is, does the NBWA convention and trade show represent the real needs of today’s wholesaler, or is it after its own financial interest by selling these booths to so many unrelated vendors? Even, today, when someone approaches an unknown beer wholesaler and asks their profession; the wholesaler will say they are either an AB or MC wholesaler. If they are an Indy wholesaler, more than likely they will state that they are a craft/import beer wholesaler. The core competency of a beer wholesaler is selling beer, but does 10,000 SKUs, flavored waters or even 10 pumpkin beers help? Just when does enough become enough? If you have no critics, you’ll likely have no success…. From the time prohibition was repealed, until the mid-1970, beer was delivered to retailers the same way: either off the truck which is called DSD. Almost all distributors had only one vendor with limited packages. Most accounts only carried one package, and grocery stores carried just two or three packages. This made selling easy. The first changes came with the rush of new imports and the beginnings of consolidation. With the eastern expansion of Coors, wholesalers felt they had to change the selling systems to pre-sell method in order to successfully handle the demands of the new brands. 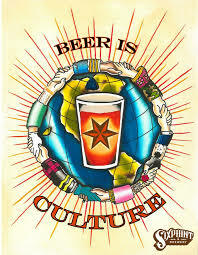 Pre-sell became the system of choice, and remains so to this day, even with the hundreds of new breweries and products. Recently, consultant Joe Thompson commented on what he thought could be the selling system of the future. According to Joe, the system will be more retail-driven with the orders generated by the retailer through web based operations and supported by the wholesalers’ tel-sell system. Using this system, the remaining sales people will concentrate on value- added programs and items. The thought behind this is to move away from the idea that sales people are nothing more than order takers, to a more cost effective sales and delivery system. In fact, one distributor the Joe studied has now implemented the new system and is seeing positive results. So then the question becomes, how will the retailer and the vendors look at this system? Retailers for years have had the luxury of having the beer wholesalers supply labor, inventory management and programs to the point where any cut backs of service might create real problems for the wholesaler. Consider a chain with stores across multiple states, with some wholesalers servicing the chain as they have for years, while others have moved to Joe’s system. If there is dissatisfaction, push back from the chain will go to the vendor(s), not the wholesaler. Do wholesalers feel that the smaller retailer will really make an effort to order on line? What if the competing wholesaler does not transition to this type of selling system and continues service as usual? Joe’s system assumes the vendors will have feet on the street, as will be required by the wholesaler. This might work in major markets; however, you cannot put people everywhere, just as a wholesaler cannot have a different sales person for every account. In large markets, the wholesaler could easily become just a delivery and warehouse for the vendor, but understand the wholesaler will then be required to work with less margins. What makes Joe’s program workable is the franchise laws. When there are only two wholesalers in a market with all the brands, the retailer has no choice because there is no way the retailer can get beer except from the wholesaler. Add in minimum orders for each delivery, and it creates a difficult environment. But this is what happens when there is no competition. A recent forecast for the domestic beer sales indicated that the industry could soon slip under 200 million bbl. in sales, and in the future, continue to lose ground to wine and spirits. Joe’s program is all about cost control, not about brand development and volume growth. With multiple sales teams with different vendor pads and strong merchandising programs, the wine and spirit wholesalers and vendors see this as a great opportunity. The beer industry continues to offer volume to the W&S guys, as the W&S teams expand calls to the retail trade. Joe’s value-added sales team may be adding value, but to whom? Based on future forecasts for beer, it is value added only for the wine and spirit industry! Remember, if you have no critics, you will likely have no success!